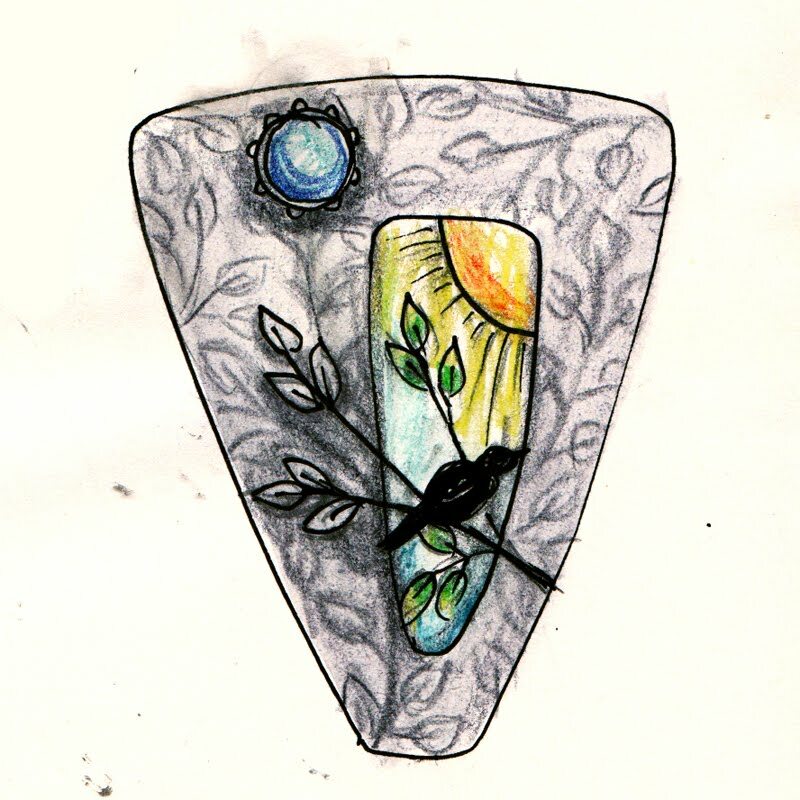 As I work with glass and silver recently, I'm consciously trying to move the designs forward. Originally I worked with rectangles of glass, since that's the easiest to cut. 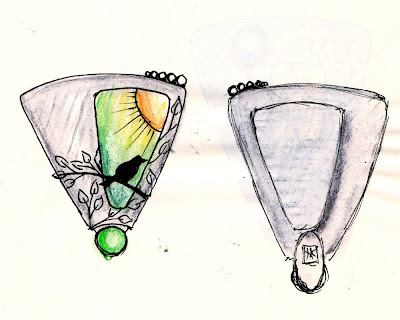 I combined these with flat mountings at first, then incorporated more decorative elements to go into the third dimension. Last week I finally moved to circles of glass, always harder to cut and grind, especially when they are tiny. I also tried a new setting, using a traditional lentil construction. This week, I'm going more free form. I've flipped my process around, making the setting first this round, whereas I usually paint and then design a mounting. It allows me a lot more freedom, as I can do the sizing perfectly the first time with no shrinkage calculations. And I can integrate the design of the setting with the painting, as here where the branch design is part silver 3D sculpted on top and painted glass in the background. It reminds me of my quilt designs where I would flip color values at borders for more interest. I've gone back to drawing in my sketchbook as well. These two drawings show the evolution of the latest pendant design. I started out with a triangular shape with an offset opening, then in the process of drawing in the texture, I realized I should make the silver and glass work together. So I drew a new version incorporating that idea. The setting was cut and refined easily. Now I need to cut the glass and paint it to assemble tomorrow. Stay tuned. Your work is beautiful!! I wish I could do something like this.